I have a lot of necklaces. There are sort of my thing. I purchase them at cheap dollar stores, flea markets and estate sales. Vintage plastic or wood beads in fun colors are my favorites. I love bracelets but I spend way too much time on the computer to wear them daily. Earrings tear my earlobes up if worn for more than an hour so I am left with necklaces as my prime accessory choice. Recently I found 3 chunky vintage bead necklaces at a thrift store. These were just what I needed to send my necklace collection over the edge of what my current jewelry storage could hold. So I had to find a new solution to organize all these lovely bobbles. Between summer camps, vacation and now two birthdays on the horizon I had zero funds to remedy this situation. 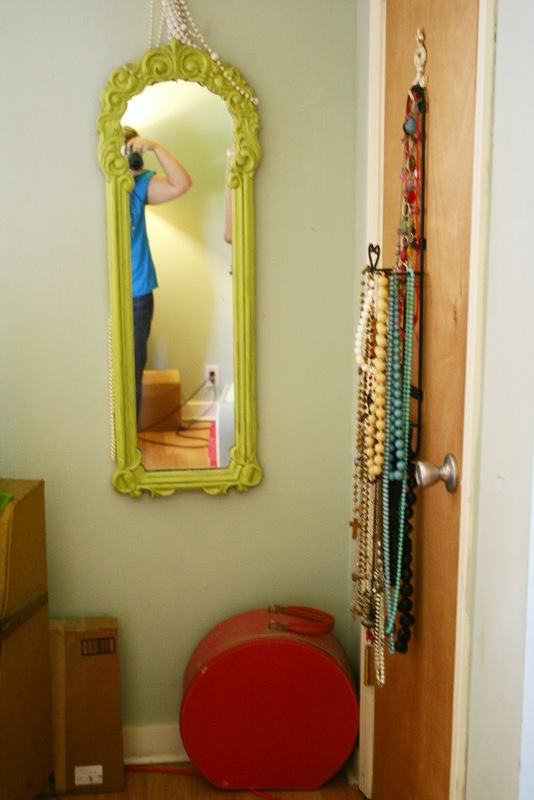 So I did what any thrifty gal like me would do, I went digging in my closets. And I found this plate rack leftover from when we painted the kitchen. 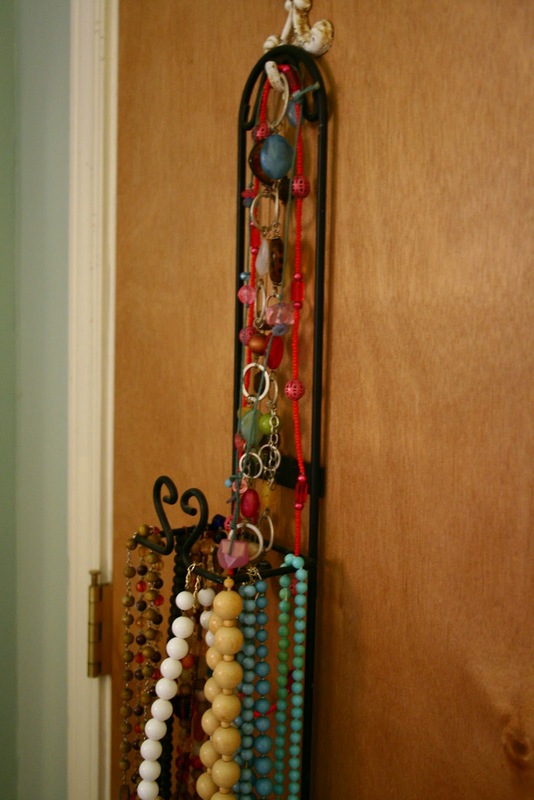 I hung the rack on an existing hook on my closet door, right by my mirror.And voila! It worked. 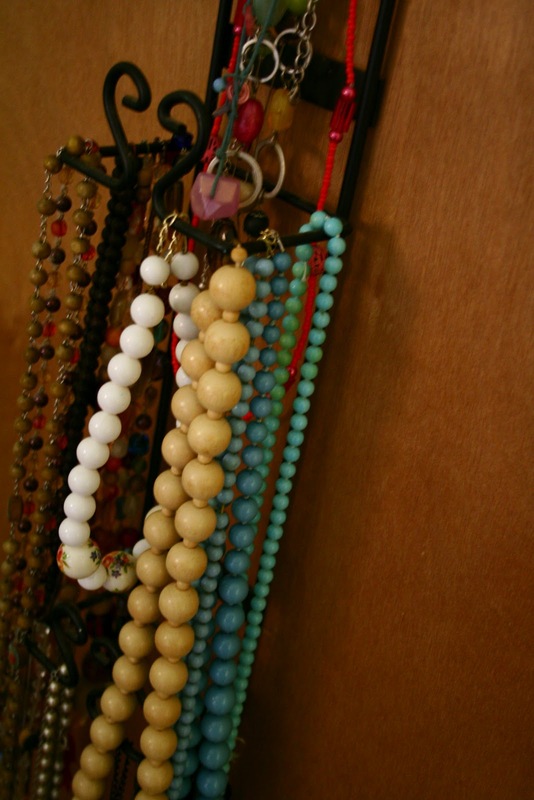 And it is the perfect location for mixing and matching my necklaces when I get dressed in the morning.This plate rack may not be the permanent solution for my growing bead addiction, but it sure is a handy and thrifty one. necklace is great in demand and liked by almost every person so this blog will really help them.